In this dance production, the mental state of a love laden heroine (Bhamini) in eight different situations in a time span of 24 hours is depicted in eight episodes. Even though Bhamini depicts rich Sringara Rasa, the hidden thought is the expression of feelings of Jeevatma searching for Paramatma in the path of devotion for attaining salvation. First episode in the present DVD is a solo performance called Yakshadarpana. Yakshadarpana literally means a mirror to Yakshagana. It includes the Poorvaranga and Pararanga, involving all the four parts of Abhinaya, Yakshadarpana gives a wonderful glimpse into the world of Yakshagana through the solo performance. The next episode in the DVD is from the life of Kunti where she abandons Karna in a river. It is a short but haunting episode taken from The Mahabharata. Vishaya is a popular theme in Badagu Tittu Yakshagana School. Vishaya a beautiful girl finds a handsome hero Chandrahasa while roaming in the jungle path and falls in love with him. The performance is an elaboration of the feelings that Vishaya undergoes and the tricks she plays to marry Chandrahasa. Next episode in the DVD is that of Dakshayini. She is the wife of Lord Shiva and the daughter of king Daksha. When due respect is not given to her husband in a ceremony at her father’s place, Dakshayini revolts against Daksha and fights for the dignity of her husband. The present DVD has two episodes. First one deals with the furious love of Shoorpanakha. During the banishment of Rama; Shoorpanakha, the demoness roaming in the forest falls in love with him. She changes her figure and becomes a beautiful lady to woo Rama. However, Rama finds out her reality and with the help of his brother Lakshmana disfigures violent Shoorpanakha and she exits in rage. Second episode is a conclusion dance (Mangala Nritya) of the traditional Yakshagana performance. It is a dance bowing to the lord of performing arts, Ranga Nayaka. The present DVD has two episodes both from the life of Krishna. When Krishna is about to leave for Mathura, Radha’s plight is shown in Venu Visarjana. Krishna gifts his flute to her as a symbol of their eternal love. This episode depicts the power of love and Radha’s turmoil on the fateful evening. The second episode is that of Poothana. The evil king, Kamsa sends Poothana to kill Krishna. She comes to Gokula disguised as a beautiful village girl and her evil is hidden behind a beautiful image. However, when she tries to feed her poisonous breast milk to Krishna, her mother in her is evoked and she submits her self to that divine experience. Janaki Jeevana (life of Janaki) presents the complete story of Sitha (Janaki) and thus becomes a Ramayana it self. This presentation is divided in to five acts and through these five segments various aspects of Sitha as a wife, as a queen and as a mother are seen. All through she also fights for the dignity of the womanhood as well. Krishnarpana is the delineation of Krishna as seen by three women who came in his life. Here Krishna is described by Yashodha, a mother; Rukmini, a wife; and Drawpadi, a sister. However, all the three characters are special. Yashodha is not a real mother to Krishna, Rukmini is eloped with him and Dravpadi is an adopted sister. However the love towards Krishna is all-pervading and sublimates to divine heights. In this presentation, one can realize the complete features of Yakshagana as a solo form. 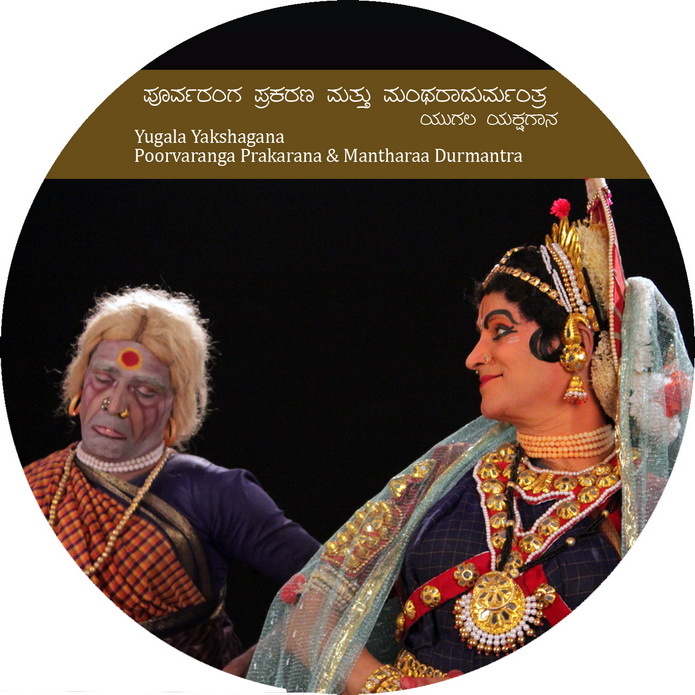 First episode in the present DVD is Yakshagana Poorvaranga. It involves the Dikpalaka Vandana (saluting the Gods of different directions), worshiping the stage, venerating the ten incarnations of Lord Vishnu and saluting to the connoisseurs. The second episode deals with the conspiracy behind the banishment of Rama to forest for 14 years. Manthara, the evil minded maid servant creates waves of doubts and confusion in the mind of Kaikeyi leading to the fateful exile to Rama. Yaksha Shikshana Trust (R) has been successfully organizing Yakshagana training in all the high schools of Udupi District (Karnataka, INDIA) from past 5 years. They train the young talents and supply a rich talent force to Yakshagana and also prepare a tasteful group of connoisseurs. Without any disparity of religion or gender, over 1500 students get the benefit of this program every year. This trust spends over 1500000 Rs every year for its endeavors. A program which contributes to the rich heritage of our land is indeed very unique. The donation you offer in exchange of this DVD will go directly to the trust. Come join us in this noble cause by contributing generously to the Yaksha Shikshana Trust (R) Udupi.